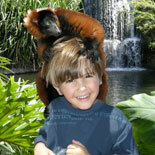 Jungle Island is an eco and family friendly Miami attraction where a day of adventure awaits all who enter. Hang out with an orangutan or get friendly with a tiger right here in Miami. Take a walk on the wild side while learning about the flora and fauna of the Everglades or Manu, Peru. Jungle Island has all this and much, much more. Jungle Island, formerly known has Parrot Jungle was established back in 1936. Even Winston Churchill found the parrots irresistible. Well, much has changed since he cuddled up with Pinky, the Moluccan Cockatoo in 1946. Pinky is still wooing visitors but now there is a wide variety of wild and exotic animals from orangutans and tigers, to penguins and boa constrictors. Daily shows entertain and educate visitors at the Jungle Theater. One show, “Tale of the Tiger” includes rare big cats such as a black panther, and white tigers. Speaking of cats, visitors have plenty of opportunities to interact with the animals. Have photographs taken while cuddling up with tiger. Plan on a full day to enjoy the exhibits and presentations at a leisurely pace. Wear comfortable walking shoes, and protection from the sun.